Home » Blogging Tips » Find out what you want? Traffic or Readers? Find out what you want? Traffic or Readers? What you want? Traffic or Readers? If you are a beginner in the blogging field or an experienced hand you would have definitely come across these two above terms “Traffic” and “Reader”. As that we all think both mean the same, there is a slight variation in the meaning of both these words. 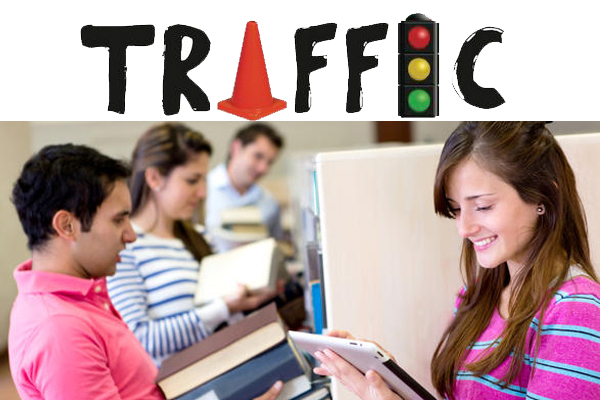 Traffic includes the people who visit your site or blog for a couple of seconds and move away on further surfing. You can clearly see this if you had a rush of traffic from the sites like StumbleUpon or any other social sites. These people are not just visitors. They are more than a passing-by visitor since they visit your blog again and again, promote your blog by leaving comments, sharing your posts, expect good posts from your blogs. Such people are more important for any blogger and the main attitude of any blogger must be attracting more readers than just the visitors. After reading above, every blogger might have known what is the difference between the Traffic or Readers and what they want. Of course. Traffic is more important for any successful blog but is that all needed to make your blog pro-motive? Beyond the thousands of visitors who passes by every day, you need standard followers to make your blog really popular and ever lasting. So now, who can concentrate on just making traffic? People who like to make money through advertisements can concentrate on bringing traffics to your sites instead of depending upon loyal readers. Also people from affiliate marketing who needs day by day visitors to review and comment on their product can concentrate on making traffic. But for others, who really do not want to make huge money out of blogging have to depend upon the loyal readers who often visit your blogs and read your post and always be a part of what you do. Add the relevant popular keywords at some places with which your blog will be coming under those famous specific keywords in search engines. Start your own profiles in the Social medias like Twitter, Facebook, Google+ and add friends to that circle. Post your latest articles or blogs to that page and ask them to visit your blog. You can also send those articles through emails, or add the URL to your email signature so that it will be sent to all the people to whom you send the mails. If your blog is related to any topics like social awareness, software, latest technology, etc you can send those articles to those specified readers to alert them with the latest updates. Share your post on social networking sites and also social bookmarking sites. Tweet your post several times with different teaser quotes. Above said ways are to bring traffic to your blogs whereas the following ways are to bring loyal visitors to your blogs. If you want to bring loyal readers to your site, the first and foremost thing is making your blog consistent and up-dative. Always make your presence felt with regular and good posts so that your loyal readers are always by your side. Reply to the comments left by your readers making them feel that their comments are noticed and honored. Length of the posts is also an important thing since the posts less than 500 words won’t seem worth reading and thus you could not form loyal readers. Make your blogs and posts attractive with relevant images and videos which automatically makes easy to navigate through the potential readers. Provide a space for your readers to introduce themselves, post any of their recent projects or posts, any links, posts which they like and so on. This will definitely bring your readers close to you. Invite them to contribute a guest post to your blogs if they are interested in. Thus, as you have read the above tips you could have found the difference between the two. Look on your work. Choose the way you want to blog. Even if you create a blog for non-money making reasons you can readily follow the above tips to make unexpected money out of your site. Share this post, if you think, this will be useful to others like you. In as much as of whatever you say, readers are indeed really more valuable than anything. I love readers and not just numbers that make up traffic! Yes i agree with you Emmanuel. It’s up to the blogger, because some wants to earn money and some do blogging for passion. To earn more money from blog, we need more traffic as well as readers. Through the regular readers, our blog get famous among others. Glad you like this post. Anyway thanks for commenting here. Keep coming. Nice post with good points. Being a blogger I do consider first we need readers then traffic. If we get reader then traffic will follow us. Yes of-course, there is no traffic without readers. But getting regular readers to our blog is not an easy thing. We have to put more effort to get it. Glad you like this post. Keep coming here. Have a happy weekend and thanks for dropping your comment.